This small and attractive winter thrush is a regular winter visitor to Arran. The first report this autumn was on 11 October. The previous winter, birds were reported from 10 October 2009 to 16 February 2010 and the winter before, the dates were similar from 11 October 2008 to 25 February 2009. 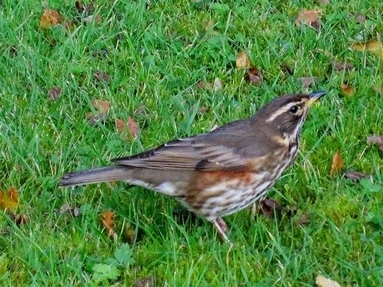 Look out for Redwing this winter. In winter and on passage, large flocks, sometimes mixed with Fieldfares, use open fields for foraging for invertebrates, but smaller groups feed amongst leaf litter in woodland. They visit gardens and even city parks. Berry bearing bushes such as hawthorns and rowan are particularly favoured in autumn and early winter until stripped. The numbers that remain on Arran over the winter are variable, probably influenced by availability of food and severity of weather, moving further south if the berry crop has failed. These Redwings, which spend the winter with us, come from two populations. In England, Wales and most of Scotland the birds originate from Scandinavia and Russia, while in Ireland and western parts of Scotland, birds are mainly from Iceland, where the population is larger and darker. Both sub-species may occur on Arran but to date no observer has indicated the sub species they have seen! A challenge? Birds ringed in Scotland in autumn have been recovered in the spring in Iceland, Finland, Denmark, Germany and Russia.